PhotographyReview: Almost anyone will be able to get good results from the Fujifilm FinePix F10. Unless you need manual exposure control or consistently shoot in low light, the F10 will work well for you. It is simple enough for Mom to use, but capable enough for a pro photographer to use as a pocket camera. 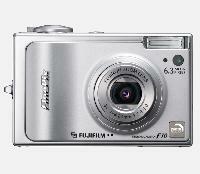 If you’re considering a pure point-and-shoot digital camera, the Fujifilm FinePix F10 is a solid choice.